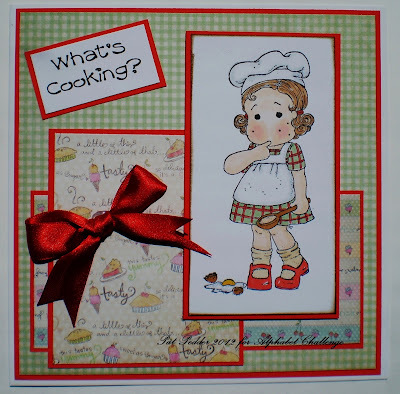 Well it's Friday the end of another week waiting for summer to arrive............ but at least it's time for another challenge at The Alphabet Challenge Blog, this week our challenge is K for Kitchen. For my card I chose a Tilda image by Magnolia, coloured her with Copics, used papers by Melissa Frances and added a bow and computer generated quote. 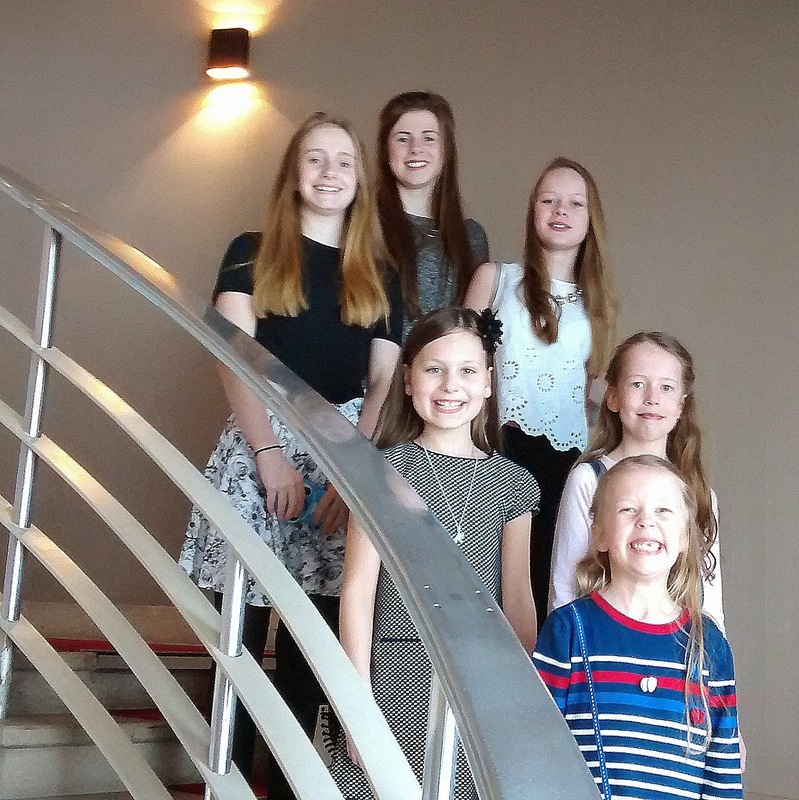 There is plenty of inspiration on the challenge blog by the DT members so why not take a look and join in the challenge this week. 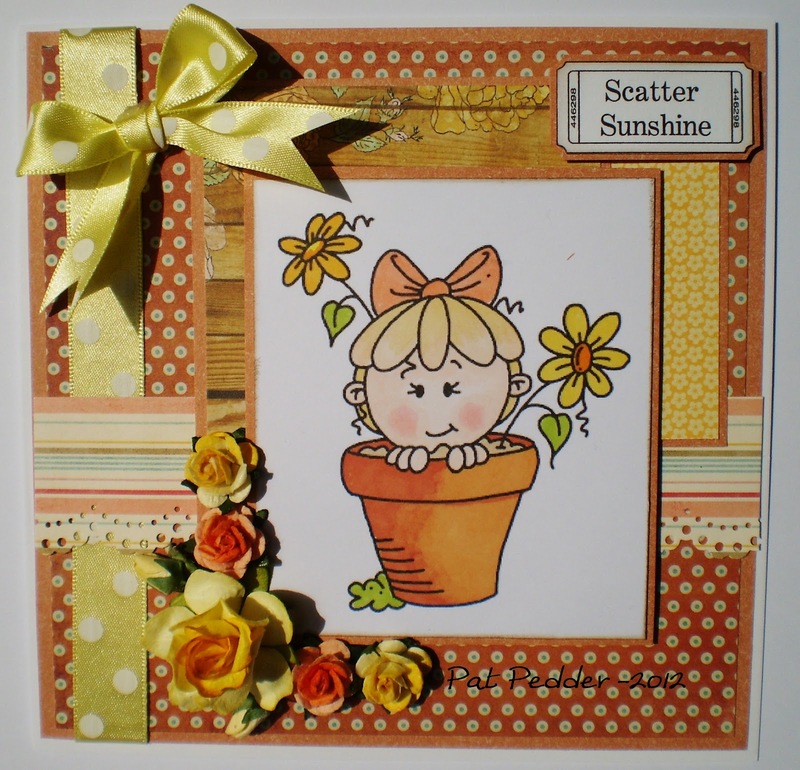 For my card I have used another image by Krista of Saturated Canary and I have coloured her with Copics. The papers all from the "Sweet Owl" pad by First Edition, flowers from Wild Orchid, sentiment courtesy of a blogging friend and I finished with lace, pearls and a little charm. 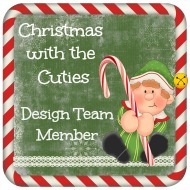 Why not take a look at their lovely creations and those of the other Design Team members on the challenge blog and join our challenge as we would love to see your cute and girly projects. 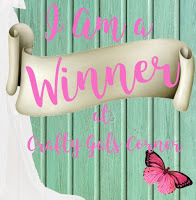 I have a card to share with you today for the challenge at Ooh La La, this will be my last card as a member of the Design Team, I have enjoyed my six months working with a great team and with some lovely designs on Wendi's CD's. The challenge today is Mystical Magic, for my card I have used an image and papers from the "Dreams of Tranquility" CD. 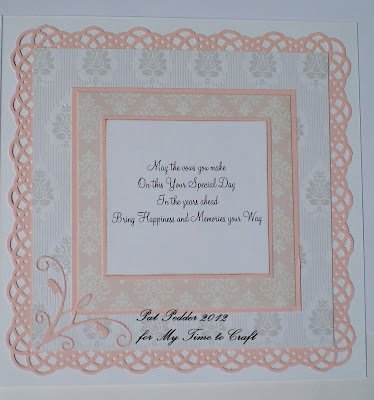 I added a swirl cut with a Cheery Lynn die in glitter paper, Martha Stewart Doily edge punch beneath a piece of cotton lace, pearl brad, small flowers, pearls and a stamped sentiment (can't remember the make). 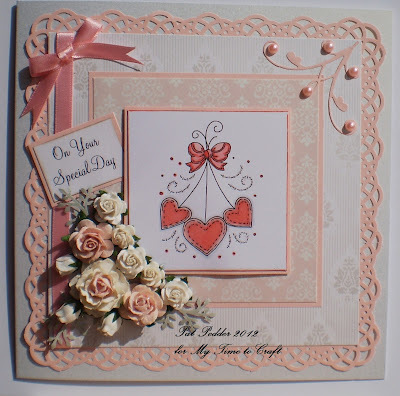 There are some gorgeous cards on the challenge blog made for your inspiration by the Design Team girls, why not take a look and enter the challenge. I have a card to share with you today I have made for my Granddaughter Jude who is 11 today, we won't see her on her birthday as she has gone away with her class from school on an adventure weekend in Wales!!!! Looking at the weather the biggest adventure will be trying to keep dry. 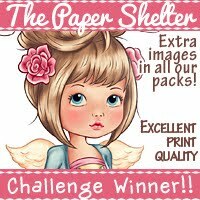 I used a digi image by Krista of Saturated Canary and I coloured her with Copics and Promarkers, the papers are by Craft Creations, Papermania and from my stash. I finished with a metal corner from The Hobby House, rose from Wild Orchid, pearls, ribbon and a computer generated sentiment. Our Sponsor this week is Bugaboo and the DT were all lucky enough to be able to pick an image from them to play with. I coloured my image with Copics, the bp is by My Mind's Eye, flowers from Wild Orchid and I finished with a ticket sentiment and some ribbon. 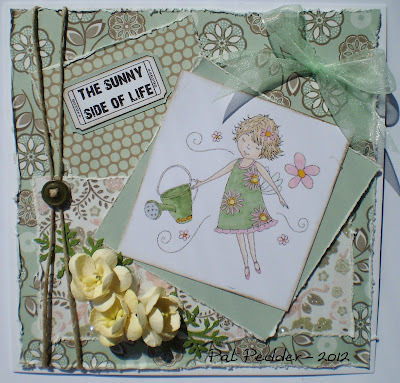 Why not take a look at the Challenge blog, see the gorgeous DT cards and join in this week's challenge. My card is slightly different in that I was asked to make this for a couple who were renewing their vows after 45 years, I used an image from Meljens Digis coloured with Copics and used some Glossy Accents on the hearts and just a sprinkling of glitter about. The white satin finished and embossed bp is by s.e.i. and the pale peach paper is from the Isabella pad by First Edition, I used a pale peach paper and punched round the page with a Martha Stewart punch. The corner die is a Memory box one and I added a few pearls to this, flowers are all from Wild Orchid with some punched branches and I finished with a ribbon and computer generated sentiment. I used the same papers on the inside. 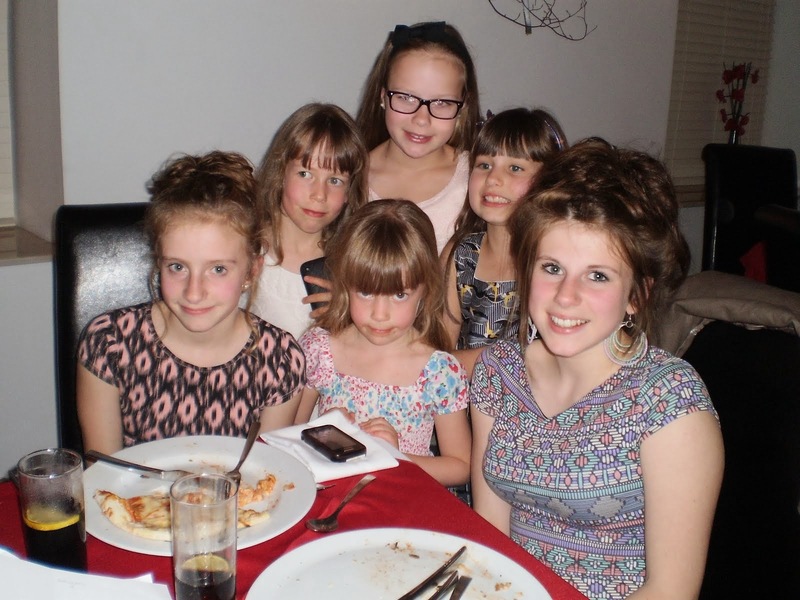 Sorry the picture is not very good I took loads but couldn't get any really good ones. 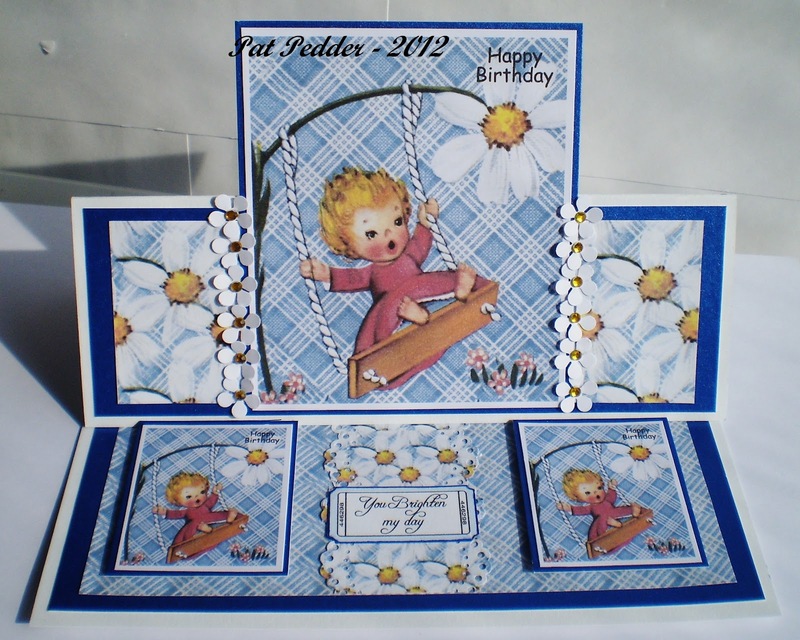 Do take a look at the blog and see the wonderful cards created by my team mates. 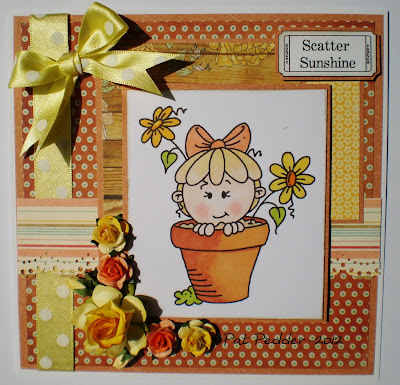 For my card I have used a Funstamps stamp that I have had for ages but I always think he is quite cute and versatile. I coloured with Copics, the bp again I have had for ages is by K & Co, and I cut the word Paris from another paper in my stash, I added a ticket sentiment and charms. 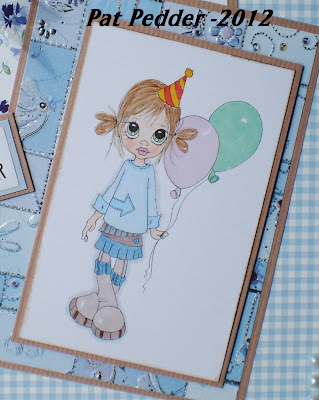 There are some lovely cards on the blog by the other members of the DT so why not pop over and take a look. Good Morning to you all, well we have had three fine days on the run let's hope it keeps up today, though it really could do with being a bit warmer, talk about flaming June!!! 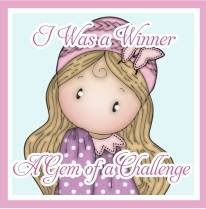 with a £10 gift voucher to spend on their goodies for the winner. 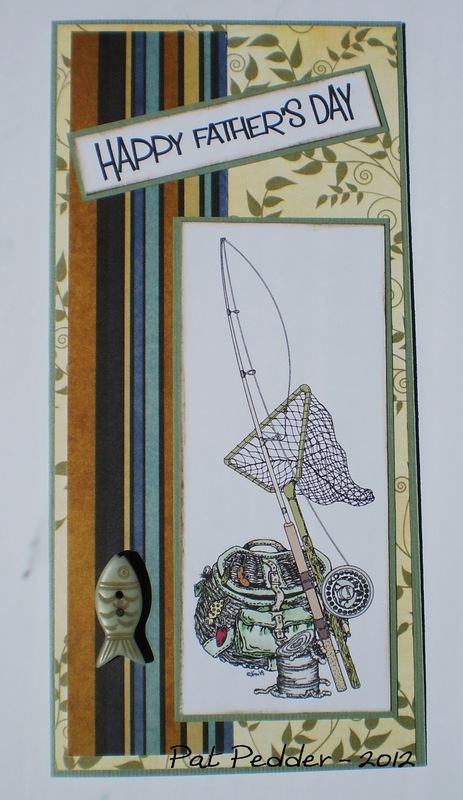 My card is made using a great fishing digital image from Nana Vic's, to which I just added a little colour. 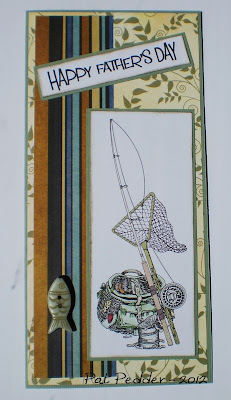 My papers were free ones from Making Cards magazine and I added a fish button and a computer generated sentiment. Do join in if you can this week and don't forget we still have a DT call running until Saturday. 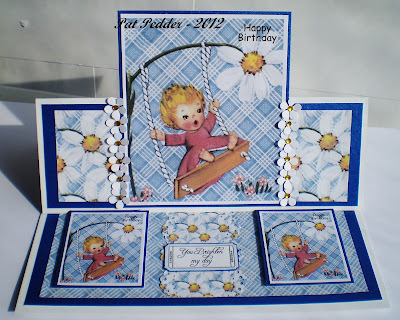 A DT card today for the challenge at Ooh La La which is Baby, we would like to see you projects featuring babies. 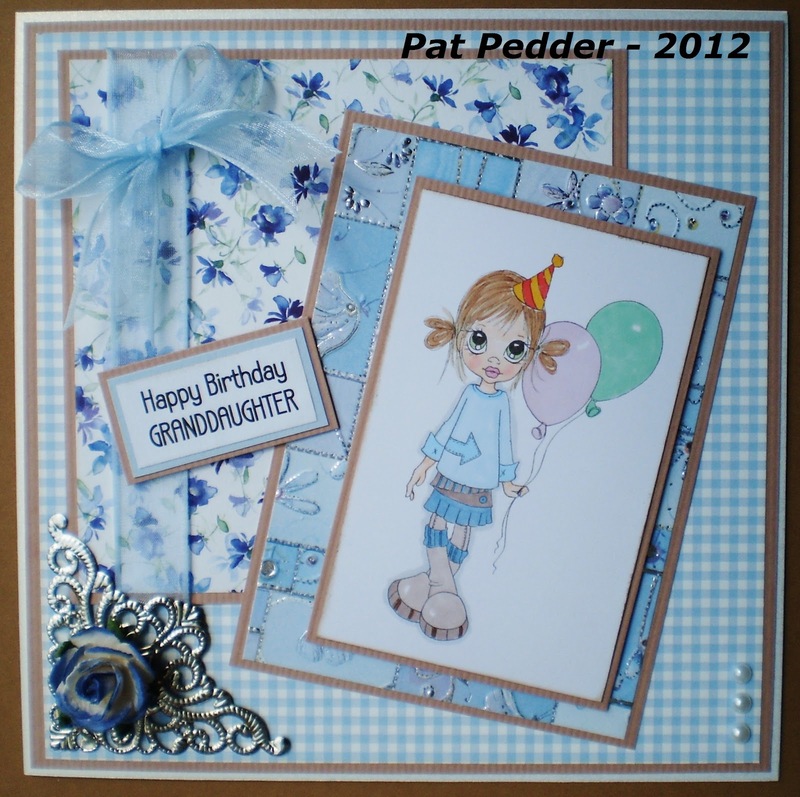 The images and papers for my card all come from the Ooh La La CD "Kiddiwinks", I added some punched flowers with adhesive stone centres and a ticket sentiment. Good Morning, Well the celebrations are over and I hope you all had a good time, the weather could have been a bit warmer but we can't have everything!! For my card I used papers from First Edition Isabelle, distressed the edges, coloured my digi with Copics, and added ribbon, button, string, flowers, punched leaves and ticket sentiment. Sorry the photo is not very good my camera just doesn't seem to like pale greens! 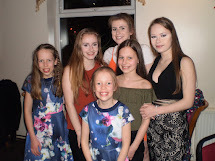 Also at Fab'n'Funky this week we are having a DT and GDT call, closing date is Sunday 17 June 8pm, if you are interested in joining our lovely friendly team please check out the challenge blog for all the details of how to enter. For my card I used a LOTV image and coloured with Copics, the papers were some free ones from my stash, I added flowers from Wild Orchid, punched leaves, ribbon, lace, a handbag charm and a sentiment courtesy of a friend. A few things for you to note about the "My Time to Craft Challenge Blog"
My card is made using a digi image from "Make it Crafty" called Frenchie Valerie I coloured with Copics, the papers are by My Mind's Eye and Imaginisce, the ticket sentiment is by Nina of Paper Cupcakes and I added a ribbon, spacer with pearl brad and some pearls. 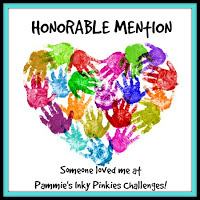 Please do take the time to check out the challenge blog and see the beautiful creations by the Design Team.